For Qurban Rites in Albany (sheeps) or Melbourne (cows), Australia, we will do the slaughtering, skinning and butchering of the animal in halal approved abattoirs. The process will be inspected by our representative in Melbourne. The cut meat will be flown to Singapore. We will further butcher the meat into portions that are ready to be delivered to your doorstep or distributed to the needy in Singapore. This year we also offer Cow. *Prices are inclusive of delivery to your doorstep. *Due to Australian regulations, pictures of before or after slaughter cannot be taken in the abattoir. 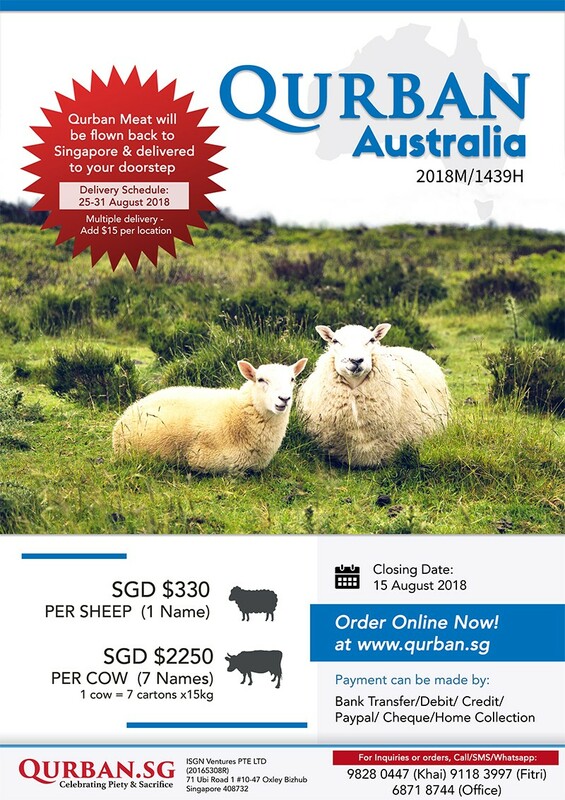 By purchasing the Qurban/Aqiqah package, each participant will receive a Certificate of Qurban which will be mailed out to the address provided by January 2019. To order, please call/WhatsApp/SMS 9828 0447 (Khai) or 9118 3997 (Fitri). Option 1: Payment by Cheque. Details will be provided after registration has been made. Option 2: Home / Office collection. Cash only. A despatcher will come to collect the cash. After registration, you will receive an email with an order ID. Simply reply to the email the full collection address and timing. Collection may take up to one week depending on despatcher availability. Option 3: Bank Transfer. Details will be provided after registration has been made. Option 4: Debit card / Credit card / PayPal. Details will be provided after registration has been made. * To make payment at our office: 71 Ubi Road 1 #10-47 Oxley Bizhub, Singapore 408732. * Payment can be made by cash/NETS/debit card/credit card. - Certificates will be provided for Australia Qurban. Receipts will be issued. - In the event that there will be flight delays due to bad weather, etc, participants will be informed for delivery date changes. - You may choose to donate all the meat or partially to charity / masjid here in Singapore. - No refunds once committed. Estimated about 18kg of mutton will be flown back to Singapore. Delivery to your doorstep is inclusive. Our admin will call to arrange for delivery. You may choose to take all the meat or donate partially to charity. Estimated about 105kg of beef will be flown back to Singapore. (7 cartons of 15kg each) will be delivered. Delivery charges to your doorstep is inclusive. *For additional delivery location, there will be a $15 per location fee. Our admin will call to arrange delivery. Qurban.sg is among the brands under ISGN VENTURES PTE LTD.